Trump's cognitive testing in context. Descriptions of Donald Trump's mental capacities range from "stable genius" (his words, as everyone knows by now) to some kind of mad dementia. It takes intelligence to become a successful businessman and to win the presidency as a relative outsider, say some; just listen to what he says, say others: his lack of knowledge about policy and policy making, his way of putting words together that sometimes challenges the label "stream of thought". The great linguist George Lakoff described Trump's way of speaking as very New York, very common folksy, and therefore politically smart; the great linguist Georger Pullum simply called it "Trump's aphasia". After looking at one excerpt of a campaign speech, Pullum ranted that "this nasty, racist, golden-quiffed, self-publicizing nutcase has barely a coherent thought in his head" and suggested that there was no sentence structure to analyze (I think the majority of linguists will disagree with the latter). Since Michael Wolff's claim that every single person who works with Trump doubts his capacity to carry out his job, questions about Trump's mental health finally became front page material. Trump's reaction to Wolff's book went beyond the usual Twitter rage to broadcasting a meeting between him and other politicians on immigration, seemingly to demonstrate his competence, and now to the release of the results of a health check carried out by a navy doctor, Ronny Johnson. Johnson mentioned a worrying BMI, but importantly, an "exceedingly well" performance on the Montreal Cognitive Assessment. Results, so Johnson, indicate that Trump will be "fit for duty" for years to come. The score is a full 30 out of 30. But what does this mean? Excerpt from the Montreal Cognitive Assessment. 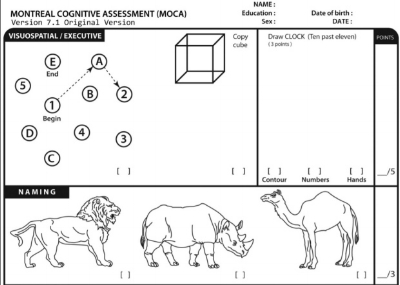 The Montreal Cognitive Assessment, or MoCA, is a quick test of general cognitive capacity, often used to screen for dementia or mild cognitive impairment. Here it is. About ten minutes to test orientation, attention, memory, language, executive function and visuospatial processing. If ten minutes were enough to properly assess all of these domains, our (i.e. psychologists') lives would be much, much easier. At the same time, the MoCA is a well established tool. On average, people who have dementia have substantially lower scores. Which score to expect depends on the person's age and education. According to a recent study by Borland and colleagues based on Swedish participants, the average healthy individual with Trump's age and education scores about 27/30. The standard deviation is pretty narrow, which means that Trump's 30/30 places him at the 90th percentile or higher in his cohort. In other words, Trump performed better than can be expected from at least 90 percent in his demographic segment. But someone who scores 30/30 is not necessarily cognitively healthy, as the MoCA is wholly inadequate to detect a wide range of mental health disorders including psychosis and narcissism. It cannot even fully rule out dementia. But that full score makes it much less likely. So there you have it. Trump's full MoCA score, if Dr. Johnson did a decent job, makes it much less likely that Trump suffers from dementia. The score addresses some, but by far not all issues raised around the man. But importantly, there is something very dangerous about the quick linking of negative personality traits to cognitive or mental health issues. It doesn't take an illness to be a liar, even if the lying seems pathological, and it certainly doesn't take brain damage to be ignorant or a racist. At the same time there are many people who live with a dementia diagnosis and are not only fundamentally decent, but also competent at managing their lives and even jobs. Pointing at someone we consider flabbergastingly horrible and attributing any kind of pathology does actual harm to people who live with an illness. It also distracts from the real dangers of racism and post-truth thinking.